Turkey's interior minister said the bomber was likely connected to a domestic left-wing militant group. ANKARA, Turkey — A suicide bomber detonated an explosive Friday in front of the U.S. Embassy in Ankara, killing himself and a guard at the entrance gate, officials said. There was no immediate claim of responsibility, but Turkey’s interior minister, Muammer Guler, said the bomber was likely connected to a domestic left-wing militant group. He did not explain why. 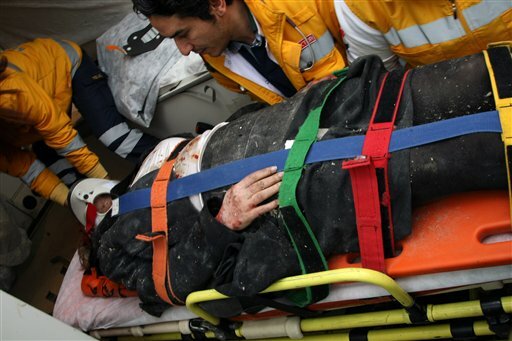 A Turkish woman was also seriously wounded and two other guards sustained lighter wounds in the 1:15 p.m. blast in the Turkish capital, Guler told reporters. A police official, meanwhile, told The Associated Press that the bomber is most likely a suspected member of the outlawed Revolutionary People’s Liberation Party-Front. He spoke on condition of anonymity because he was not permitted to speak to the press. The explosion occurred inside the security checkpoint at the side entrance to the U.S. embassy, which was being used by staff. A guard standing outside the checkpoint was killed and while the two other guards “were standing in a more protected area,” Guler said. Police and ambulances swarmed the area and authorities immediately cordoned it off. TV footage showed the embassy door blown off its hinges. The windows of nearby businesses were also shattered by the power of the blast, and debris littered the ground and across the road. The inside of the embassy did not appear to be damaged. “But we will stand firm and we will overcome this together,” he said. The embassy building is heavily protected and located near several other embassies in Ankara, including that of Germany and France. 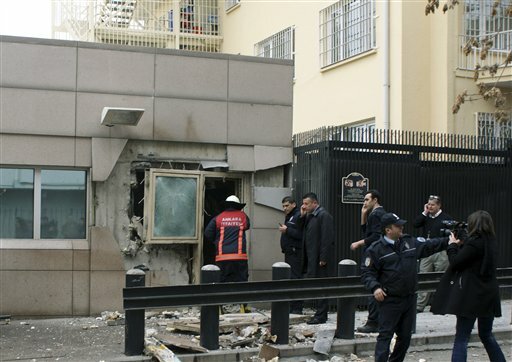 The Hurriyet newspaper said staff at the embassy took shelter in “safe room” inside the compound soon after the explosion. Guler identified the injured woman as 38-year-old Didem Tuncay, a television journalist and a hospital official said she was “not in a critical condition.” News reports said she was at the embassy to get a U.S. visa. “We can confirm a terrorist blast at a check point on the perimeter of our embassy compound in Ankara, Turkey, at 1:13 p.m. local time,” State Department spokeswoman Victoria Nuland said in Washington. “We are working closely with the Turkish national police to make a full assessment of the damage and the casualties, and to begin an investigation,” she said. Turkish police were examining security cameras around the embassy. Britain’s Foreign Secretary William Hague condemned Friday’s attack “in the strongest terms,” and said Turkey and the U.S. will get the U.K.’s full support as they seek to hold those responsible to account. Turkish Foreign Minister Ahmet Davutoglu, speaking to reporters during a visit to Belgrade, Serbia, said he was saddened that the attacked had occurred in Turkey. “We have always shown great sensitivity to the protection of foreign missions and we will continue to do so,” he said. Homegrown Islamic militants tied to al-Qaida have also carried out suicide bombings in Istanbul, Turkey’s bustling commercial center. In a 2003 attack on the British consulate, a suspected Islamic militant rammed an explosive-laden pickup truck into the main gate, killing 58 people, including the British consul-general. Turkey is also being deeply affected by the brutal civil war in neighboring Syria, and has become a harsh critic of President Bashar Assad’s regime there. The war has left at least 60,000 people dead so far, according to the U.N., and Turkey is sheltering tens of thousands of Syrian refugees.